Tuesday was my birthday, and I spent it as I’ve spent most of the last 8 birthdays or so–riding my bike around. In New Orleans, I would try to follow the same route from year to year, a chance to check on what, if anything, had changed in the year since I’d last notched one. One thing they all had in common was the sweat, so much sweat. Summer in New Orleans is oppressive, like trying to breathe in swamp water. As long as you keep pedaling you stand a chance to stay cool-ish, but every stop was a whole new drenching as your pores open up and try to cool you down. I’d ride out through the upper ninth, the lower ninth, across into Jefferson Parish, out past Chalmette, the long way home. I’d bring so much water and so many towels, because that’s riding in New Orleans in the summertime, and oh, I still miss that. In Baltimore I just take a ride, and it’s almost as sweaty, or sometimes sweatier, because riding in the heat and humidity on hills is a whole different ball of wax. On Tuesday that ride took me to Mount Vernon for a three-hour meeting and then south and west to Canton for a birthday lunch at my favorite casual dining establishment before zig zagging north and east back toward home. I decided to start the zagging on Haven Street so I could check out some of Baltimore’s finest industrial wastelands. This is Canton, a brodude part of town, but just a few blocks from the condo lofts there’s the dug-out pits of promises of what’s coming next–at least that’s my guess. 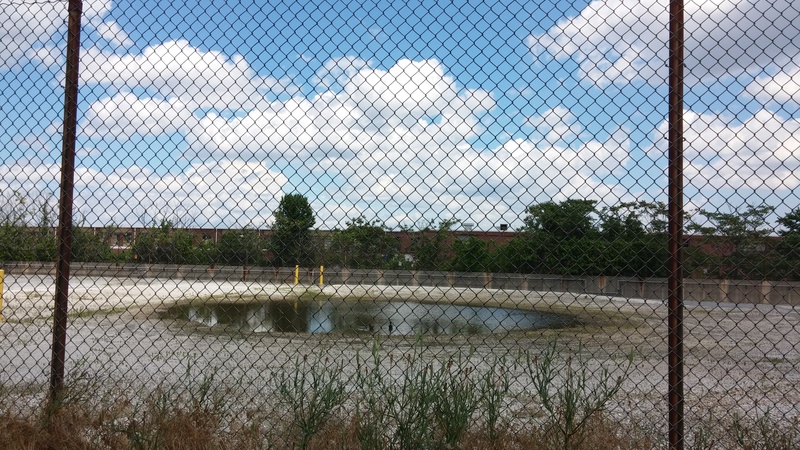 I snapped this picture of a pool of water behind a fence in an overgrown part of this, and you can’t see it, but there are a couple of ducks flapping around in there. We all make ourselves at home where we are, with what we’ve got, I suppose. And then I just rode, got myself lost and then found again, and then lost, and then found in Clifton Park, the slow hot pedal up to home. Seltzer water never tasted so good, and I’m happy to report my birthday was a most excellent day, largely because it was like a lot of my days–I’m just that lucky. This entry was posted in industry, personal and tagged Baltimore, birthday, Canton, Clifton Park, heat, industrial wastelands, South Haven Street. Bookmark the permalink.